According to a study done by the American Association of Orthodontists, one third of Americans are unhappy with their smile. 77% of women think a crooked smile is a bigger turnoff than a receding hairline. The good news? Cosmetic dentistry offers solutions far more permanent (and less obvious) than a toupee. Between crowns, veneers and composite bonding, there is a solution that gives you the smile you’ve always dreamed of flashing. But which one will give you the most confidence in your pearly whites? Crowns, or caps, come in porcelain, metal or porcelain-over-metal material options, with porcelain-over-metal providing the most strength. Crowns are placed over the entire 360° tooth surface, and replace the entire exterior of a tooth. Crowns can be the best option if you have significant cracking, chipping or decay of a tooth, as they recreate the form of a damaged tooth while protecting what’s underneath. Crowns can be placed as a cosmetic procedure, but they are also common in many non-cosmetic procedures which require additional protection of the tooth, such as root canals. 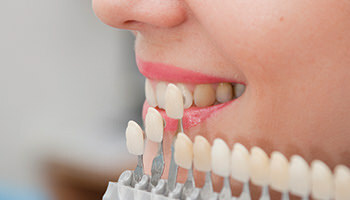 Unlike crowns, veneers cover only the front surface of a tooth. Veneers can be a good option if the underlying tooth is in good condition, but you’d like to alter the shape or appearance of it. Veneers can be a great option for addressing gaps between teeth, or altering the color of a tooth that doesn’t respond to whitening. The addition of a veneer requires a small layer of your tooth enamel be removed, and because of this veneers are not considered a “reversible” procedure. Veneers are typically a cosmetic procedure performed on the outwardly visible teeth. Direct composite bonding is a cost-effective solution used mainly for chipped teeth. It’s an additive procedure, so it doesn’t require removing any of your existing tooth. Direct composite bonding shouldn’t be confused with adhesive bonding, which is used to adhere both crowns and veneers to the tooth. Composite bonding is a separate material, designed to mimic the dentin and enamel of your natural teeth. Composite bonding offers a long-lasting solution to add to or replace part of a tooth that is otherwise healthy and aesthetically pleasing. Our office will help you determine which solution fits your needs and your budget. And the best news? None of these options require maintenance beyond your normal healthy dental hygiene routines, and with the right care they can all last decades, even a lifetime. You don’t have to be unhappy with your smile. There are options available, and we’re here to help.